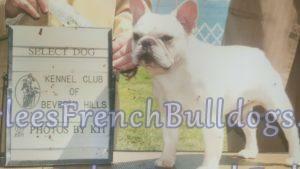 A small note about me, and my passion for frenchies. 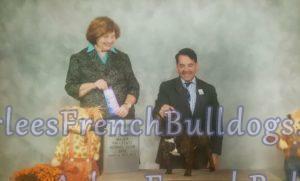 I have been french bulldog breeder over a decade. I am located in Southern California. I am about 2 hours from San Diego, about the same distance from Los Angeles. 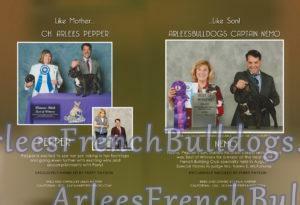 So you are welcome to come and visit us and see our french bulldog parents as well as french bulldog puppies for sale. It is a very exciting and interesting experience showing frenchies. I have been involved in the show for a while now. My first show dog is Sid. 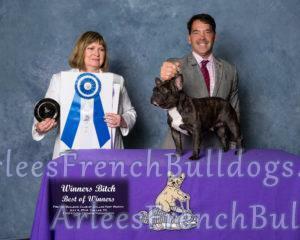 Sid came to me as an experienced show dog. He already was a champion then. I was hesitant at first to continue to show. 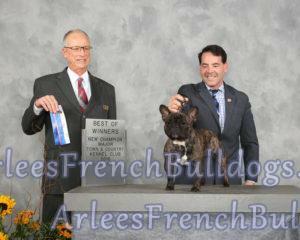 AKC at the time, just rolled out a Grand champion program. So, I thought about it, and then started to continue to show. Never looked back ever since. My daughter had shown him, as well as I did. We are conveniently located within about 2 hours drive from San Diego, Orange County, Arizona, Nevada and Los Angeles. She is absolutely amazing! I love her!!! Lilly, We have been so blessed with our Elli! She will be 9 in June! I check your website from time to time and know we will be asking for another puppy in the future. Lilly, We have been so blessed with our Elli! She will be 9 in June! I check your website from time to time and know we will be asking for another puppy in the future. Happy Mother's Day! Gracie is doing great! We went to the vet a couple weeks ago and she is about 22lbs. She's very happy and healthy and still going on long walks every day! Right now, we are training to have her become a therapy dog through Pet Partners, so we can begin going to Children's Hospital and different places like that. Gracie is doing great! We went to the vet a couple weeks ago and she is about 22lbs. She's very happy and healthy and still going on long walks every day! Right now, we are training to have her become a therapy dog through Pet Partners, so we can begin going to Children's Hospital and different places like that. We are proud to present our champions, multiple show winners.